Written as part of a published thesis: A Model for Evangelization through Sacred Art and The Rite of Dedication of an Altar by Kerin Buntin. Saint Mary-of-the-Woods College library. 2012. Saint Louis de Montfort Church in Fishers, Indiana commissioned Julie Ball, a sculptor and instructor from the Indianapolis Art Center. Church documents say, “The integrity and energy of a piece of art, produced individually by the labor of an artist, is always to be preferred above objects that are mass produced.” Julie Ball said, “This sacred art sculpture is my largest in stature and size and it showcases reverence to God utilizing mixed metals that reach into the highest of the heavens.” The Pastor of Saint Louis de Montfort Parish, Father Pat Click, led the liturgical art committee that included discerning the artist with Sheri Conner, Mireille Wannemuehler and Julie Ferrucci. The grouptraveled to Saint Meinrad Archabbey after their done within a dome renovation was completed. Through a theological reflection process the group aspired to give due reverence to the tabernacle once it was moved from the Adoration Chapel into the church. Often times our faith can reveal and deepens through the expressive language of art and creativity. After meditating and reflecting on scripture, God’s presence was providential moving toward a steel and bronze sculpture. The Code of Canon Law states “the tabernacle in which the Most Holy Eucharist is reserved is to be situated in some part of the church which is distinguished, conspicuous, beautifully decorated, and suitable for prayer.” The sacred art sculpture is located directly behind the altar. A glass shelf created a floating effect. By positioning the glass slightly higher than the altar it is meant to draw the People of God into the mystery, awe, reverence and wonder. “The sacred art steel sculpture reaches thirteen feet tall depicting earthly life,” said Ball. 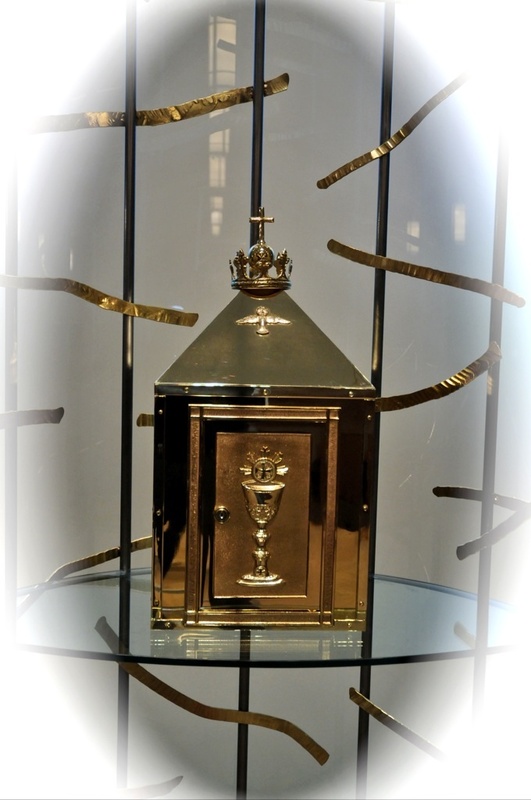 Church documents reveal that “The tabernacle be immovable, solid and locked.” This tabernacle enclosure gives reverence to the Blessed Sacrament and is meant to bring the divine to the human world in profound beauty. Separately, Saint Catherine of Bologna is the patron saint of artists and her feast day is celebrated on March 9. Pope Benedict said that she suffered great temptations of disbelief, of sensuality and of a difficult spiritual struggle. She felt forsaken by God and found herself in the darkness of faith yet she was always holding the Lord’s hand, she did not leave Him, she did not abandon Him. The author of The Seven Spiritual Weapons, she says “to believe that alone we will never be able to do something truly good” is an inspiration for Catholic artists today. The hands of the sacred artist and the team were formed by God, and for His glory.